Children ages 4-10 are invited to join us for our Christmas for Kids on Saturday, December 8, from 9:00am-11:00am. Children will do crafts, sing Christmas songs, have a snack, and of course, hear the Christmas story and why it is so important that Jesus came to our world. Join us for Thanksgiving Day worship at 10am and our annual potluck Thanksgiving DInner immediately afterwards for wonderful Christian family and fellowship, great food, and football! Turkey will be provided, you are asked to bring a side dish to share. Join us for a special service of praise and thanksgiving on Thanksgiving Eve at 6:30 p.m.
On Wednesday evening, October 3, Mount Lebanon is hosting a concert by Chris Driesbach. We'll serve a free dinner for all at 6 pm which will be followed by the concert at 6:30 p.m. For more information about Chris: http://www.chrisdriesbach.com. 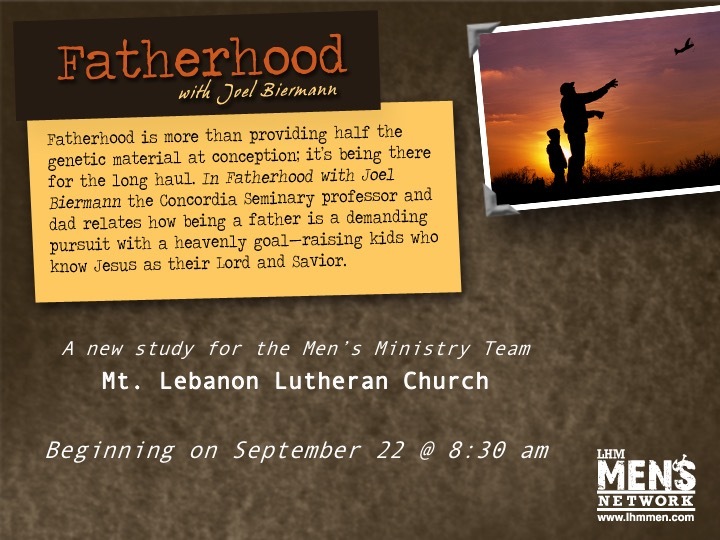 Fatherhood - A new study for Men. Fatherhood is more than providing half the genetic material at conception; it's being there for the long haul. In Fatherhood with Joel Biermann the Concordia Seminary professor and dad relates how being a father is a demanding pursuit with a heavenly goal-raising kids who know Jesus as their Lord and Savior. Few things in life can be more intimidating that taking on the role of fatherhood. Whether it's a planned event or one of life's little surprises it demands our full attention and a commitment to put our all into it. This Men's NetWork Bible study addresses the challenges in being loving and Christ-like fathers to our families, especially in a society that frequently portrays dads as buffoons and ill-equipped to care for themselves, much less their kids. Full of Scriptural insights and personal observations won from his own role as father and husband, Biermann offers help to would-be-, step-, divorced, single or widowed dads, who want to make the most of their lives with their families. To make a big point, Biermann goes back to the little Greek word telos, meaning "goal," "purpose" or "objective." Even as Christ's focus or goal was to accomplish His Father's mission on earth for our salvation, so should our objective be to become Christ-like dads for the raising and well-being of our families. Being a good father isn't an impossible dream, but it does take staying the course, especially in a world where sacrifice and upright character are often not highly valued. Difficult as the task may be, there is always hope. With God at the helm, all fathers-whether rookies or veterans-can know the adventure of fatherhood as one that is full of promise and possibility for them and their families. For more information contact Staff Minister Schuessler. Saturday, September 15th marks the date for the 5th annual Mt. Lebanon Mixed Scramble Golf Tournament. Reach out, invite your friends and join us for a fun filled afternoon of fellowship and golf. The golf tournament also serves to raise awareness for our Food Pantry and Support Group ministries. This year’s event will once again be at Kettle Hills golf course and is set for 1:30 pm. The cost is $30 per person and includes nine holes of golf, cart, and prizes. Contact Staff Minister Mike Schuessler at staffminister@mtlebanonluth.org for more information or to register. You may also register online here. On 8/26 Missionary John Roebke will be at Mt. Lebanon to share his experiences of serving as the Director of Communications for One Africa Team. Missionary Roebke and his wife Nancy have been living in Malawi since June 2018 and currently reside in the city of Blantyre. Join us on Sunday, August 19 at 9:30 am for our annual corn roast. We’ll start with an outdoor worship service with music led by Branches Band. During the service we will install our newest teachers and kick-off the school year with song, prayer, and God’s Word. Following worship, the corn roast will begin. Corn will be roasted. Hotdogs will e grilled. Other goodies will be shared. And fun will be had. There will be activities available for the whole family. Be sure to join us for this great time of worship, food, fun and fellowship! On Wednesday Nights the whole family is invited for dinner, fellowship, and Bible study. We want to bring the whole family together around God's Word. Child-care is provided for children 6 years old and younger. On Wednesday, 8/15, we will begin a brand new study looking at the life and work of Gideon. Don’t know who he is? This is a great opportunity to get to know him. Scared as you face life? This is a great opportunity to grow in God’s Word and learn to face life and its challenges without fear.